At first glance, Sand Tray Therapy looks like play. However, it has consistently proven effective. Sand Tray Therapy is a safe way for your son to share emotions. He may share feelings he is not comfortable discussing anywhere else. 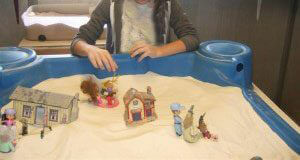 In our Sand Tray Therapy station, hundreds of small figurines of all kinds surround a large, table high sandbox. Your son will pick which figures he would like to use. These figurines are representations of his feelings or emotions. The process of picking figurines, the resulting play, and discussion will reveal new aspects of his struggles. The therapist will help your son explore those emotions or issues as part of the healing process. Although this type of treatment or experience may seem immature, there have been many great therapeutic moments. One of our team members often shares an experience he had with a news reporter who visited our program. The reporter asked about the odd appearance of “sand tray” therapy, toys and how that applied to teens and recovery. The reporter was asked to try it out. First, she selected a handful of figurines. Then, she began by creating scenes based upon the questions asked by the therapist and the answers she gave. During this test-session, the reporter started to get emotional. Afterward, things came in to perspective for her. She understood her life and relationships in new ways. As a result, the reporter had a small taste of the effectiveness that experiential therapy. It is an example of the way experiential therapy can have on help people identify and work through challenges in a safe setting.